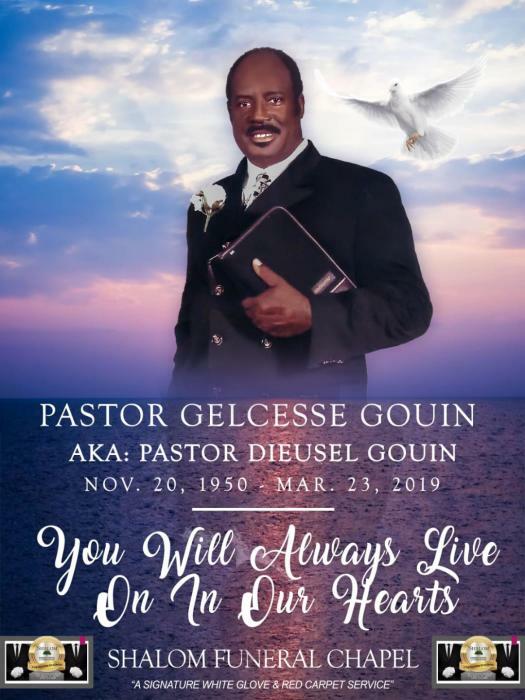 THE GOUIN FAMILY IS MOURNING THE PASSING OF PASTOR GELCESSE GOUIN, AGED 68. PASTOR DIEUSEL WENT TO BE WITH THE LORD ON SATURDAY MARCH 23, 2019 IN FORT MYERS. FRIDAY APRIL 5, 2019 7:00 P.M. - 9:00 P.M. FINAL VIEWING: 9:00 A.M. SERVICE: 10:00 A.M.
FRIDAY APRIL 5, 2019 FROM 10:00 A.M.
FOR MORE INFORMATION, PLEASE CALL SHALOM AT 239-415-0088.